Features a large 3 1/2 quart capacity with 6 feeding ports. 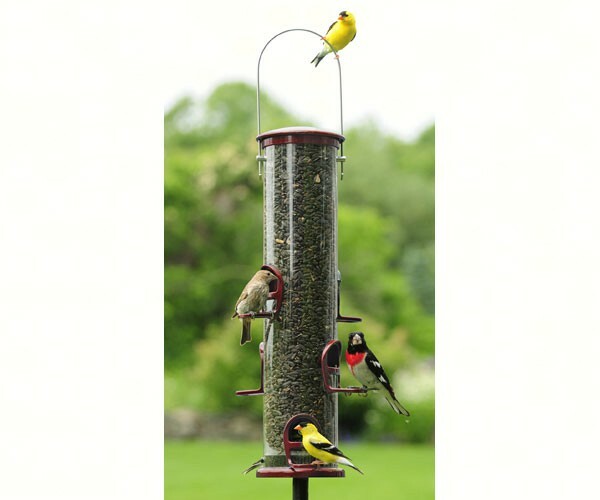 This feeder also features a Quick-Clean removable base for easy cleaning. The Aspects' Big Tube Feeders feature a Cardinal Perch. Based on years of collected ornithological data and thoroughly field tested, the Cardinal Perch offers birds of all sizes the optimum perching options in which to feed. Featuring a generous perching area and a wider feeding opening, the Cardinal Perch encourages a wider variety of birds to feed for longer periods. base without the need of tools even with a seed tray attached. A built-in seed deflector in the base allows birds to remove every last seed. The metal cap lifts and pivots easily for filling and cleaning.